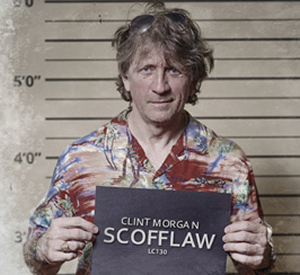 Lost Cause Records is pleased to announce the release of Scofflaw, the sophomore album of singer/songwriter/pianist Clint Morgan. The 18-song tale of loss and redemption features collaborations with multiple Grammy nominee Maria Muldaur and multiple Blues Award nominee and winner Diunna Greenleaf. 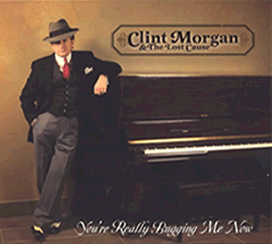 Other musicians featured on the CD include bassist Dave Roe (Johnny Cash, Vince Gill, Dwight Yoakum, Loretta Lynn); guitarist Kenny Vaughan (Marty Stuart, Trisha Yearwood, Lucinda Williams, Ray Lamontagne); drummer Jerry Roe (Rodney Crowell, Emmylou Harris, Darius Rucker, kd lang); violinist Jonathan Yudkin (Rascal Flatts, Travis Tritt, Guy Clark); and multi-instrumentalist Jim Hoke, whose credits are a virtual who's who of American music. Scofflaw is co-produced by Morgan and Maryland-based Kevin Johnston of Orca Sound Studios and mastered by Jim DeMain. All songs Public Domain or BMI, except "Wanted Man" SESAC and "Waco" SESAC and BMI. Produced by Clint Morgan, Kevin Johnston and Rob Thorworth. The Philadelphia Inquirer says: “’Scofflaw’ is a sweeping conceptual masterpiece of Americana.” For more reviews, visit www.clintmorganmusic.com >. Join blues master and Blues Music Award winner Diunna Greenleaf and boogie-woogie piano prodigy Clay Swafford for an evening of blues! 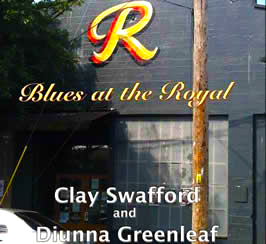 Recorded live at the Royal Lounge in Olympia, Washington, Diunna and Clay serve up a dozen tunes - some old, some new, but all blue! Running the gamut from soulful to raucous, this 60-minute set showcases Diunna's powerful voice and Clay's lightning-fast hands in an unforgettable evening of music. 60 minutes. This DVD can be purchased direct only. 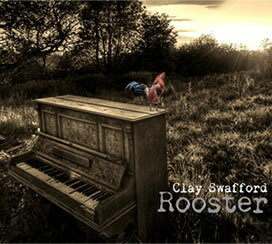 "Rooster" is a personal, acoustic album featuring blues and boogie piano ace Clay Swafford playing some of his own compositions as well as some of the little-known blues gems that influenced him. This album is a pure and raw return to the old piano house rent parties from back in the day, with no tricks and no digital manipulation. "Rooster" includes classic blues and boogie tunes as well as some original instrumental works that really showcase Swafford’s lightning-fast fingers. Guest vocalist and Blues Music Award winner Diunna Greenleaf sings on five tracks, and Clay’s steady and grooving piano backs up her voice perfectly. Also featured on the album are Blues Music Award winners Bob Margolin and Bob Corritore. Margolin sings and plays slide guitar in two tracks recorded at Hopson’s Plantation in Clarksdale, Mississippi, and Corritore’s harmonica squeals and moans the blues with the All Stars in a track recorded in Phoenix. Clay has the ability to be the backdrop to a voice like Diunna’s, Margolin’s slide, or a mean harmonica like Bob’s and take center stage with his whip-fast playing. As Pinetop Perkins himself said, ""He’s tearing the keys down on that piano, man!" And a stamp of a approval from Jerry Lee Lewis is no small deal. "As long as guys like Clay are out carrying on this music it will always be around." "Rooster" is destined to be a classic! Produced by Clint Morgan and Clay Swafford. If you like romantic ballads, lush string arrangements, and heartfelt lyrics of undying love to whisper to your soulmate - whatever that is - then this album ain’t for you. Run to the nearest Starbucks, order a latte/mocha/frappa-whatever drink, contemplate your carbon footprint for the day, put on a Celine Dion CD and go to your happy place. Everything is okay. On the other hand, if you like plain yellow mustard, any kind of meat as long as it’s barbecued, sweet tea, and you drag yourself to church on Sunday morning no matter how late you were up on Saturday night just because you told your mom that you would, then you’re our kind of people. Hard charging country, piano-pumping boogie-woogie and rock-n-roll with some gospel thrown in because it’s the right thing to do. Blues you can use. Not a love ballad to be had.Lyrics about life here on earth, not some alternate universe of gumdrops, puppy dog tails, and cartoon birds cleaning your house and braiding your hair. Spend a few of your hard-earned shekels and pick up this record. You’ll thank us later. Clint's website >. All songs Public Domain or BMI. Produced by Clint Morgan and Brent Pendleton.